Commissioned by the University’s Chancellor – Mrs Leneene Forde, the team at Michael Bryce designed the original concept and we collaborated to bring the design into production, adding to the outcome in numerous ways. 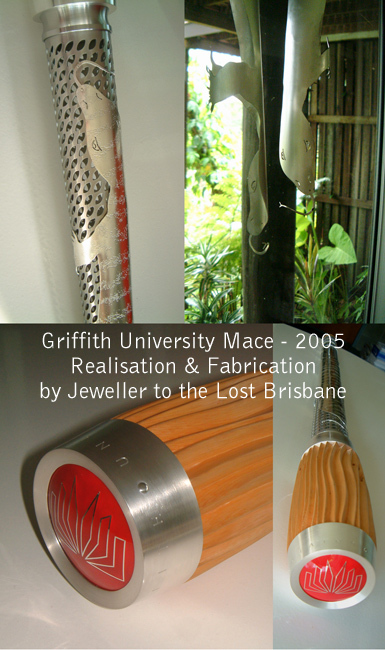 The ceremonial Mace for Queensland’s Griffith University was made with the assistance of John Sorenson (the last remaining L.J. Harvey apprentice) on the woodcarving, Barbara Heath and Juan-luis Gonzalez on the metal work, enamelling and the fitting of the entire object. Dennis Arnold, the industrial designer at Bryce Minale designed the ceremonial presentation box. A most significent object and a delightful collaboration – thanks again to Mr Michael Bryce.